So, you’ve assembled a nice collection of synthesizers. Maybe there’s hardware – some KORG volcas, a MeeBlip or two, or even modular. And of course, you have software synths, as well. Playing each individually – that’s kind of limited. Why not treat these as the digital instruments they are? That’s the idea behind Polymer, a new Mac app out today on the Mac App Store. 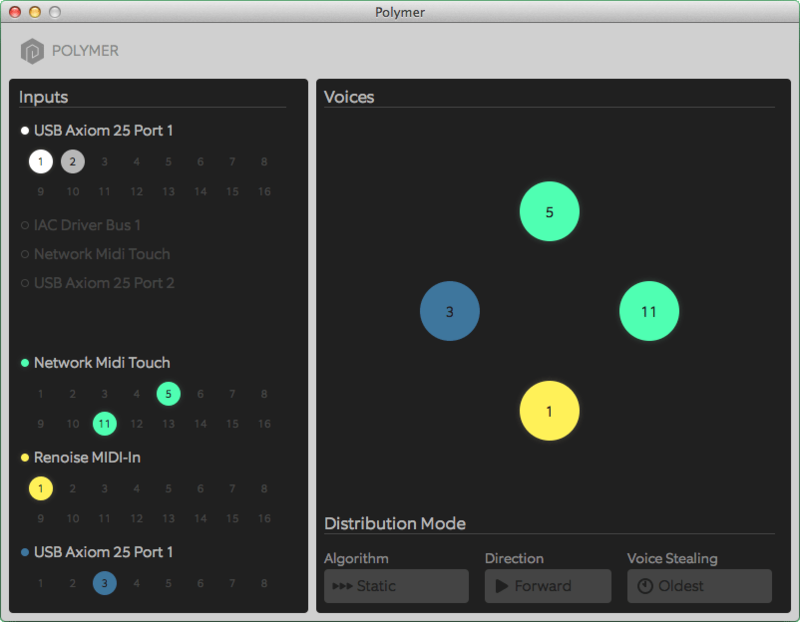 It can turn multiple monophonic synths into a polyphonic synth – making a “giant mutant polysynth” out of devices you’ve got. In fact, you don’t even have to use hardware exclusively – it works with software apps, too. Having covered hardware earlier today, many of you complained that you don’t have the money for hardware. Here, a couple of cheap monosynths can be a polysynth; a MeeBlip and Massive can turn into a hybrid software/hardware instrument. Basically, if it uses MIDI – hardware or software – you can now treat it as one instrument. This was certainly possible before, sure. But it’s never been quite this easy. CDM got an exclusive advance look at the app. Our full review and some demos will come shortly, but I’m already really impressed. First, select the inputs you want to use – software or hardware. Then, select the outputs you want to use – again, software or hardware. Each gets a nifty colored circle, which animates as you use the app so you can see what you’re using. You can also choose direction: forward, reverse, or random, and distribute notes either by rotating from the same voice each time, or cycling through them round-robin style. Of course, this isn’t limited to monosynths, either; you can create interesting cycles of notes across polysynths or massive stacks. 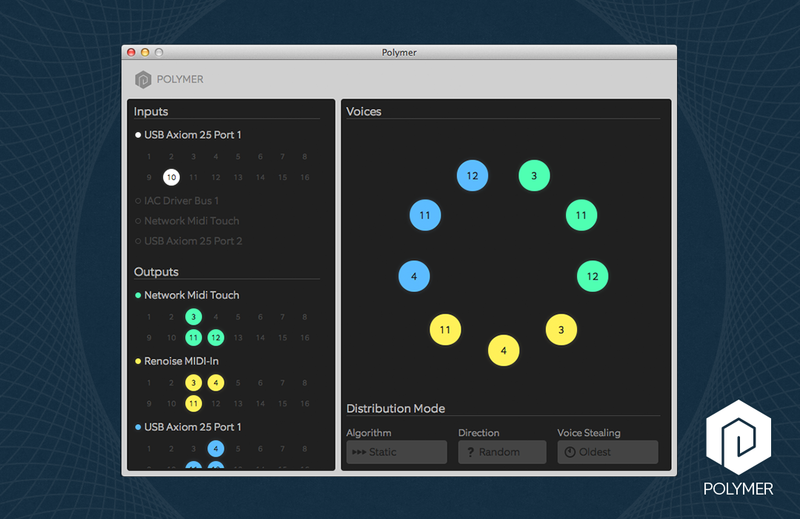 When Polymer first released some teasers, many folks expressed some skepticism about whether this was really needed. But it’s the speed with which you can configure Polymer that makes it a formidable tool: suddenly, all that mucking about with channels and configuration is reduced to steps that literally take only moments. It’s also a useful way to contend with multiple MIDI interfaces (for instance, a dedicated MIDI interface and one of the MIDI ports you got “for free” on a controller or audio box). You can control up to 32 channels, merge between unlimited MIDI channels, and send velocity, pitch bend, and mod automatically. All you need is a USB MIDI interface and a Mac running OS X 10.7 or later – sorry, no Windows or Linux version. Another good idea: get a MIDI Thru box like the Kenton – if you lack extra MIDI ports, it saves you money and extra gear in your bag. It’s easy to imagine some features that Polymer could add, though it’s already great to have this in a single window. And for good measure, here’s a great video from Shawn aka dark side of the tune, showing off a hypnotic ditty made with modulars.